As we all know in M13 the Titans (Primeval, Frost, Inferno, Grave, and Sun) are NOT getting reprinted and are getting the boot out for the next format. Now I was talking to a friend a while back about making a set of 5-6 cards to replace the titans, for fun. I told him I would draw up the sketches for it. At any rate, using the ideas we stormed up, I decided to pick them back up. 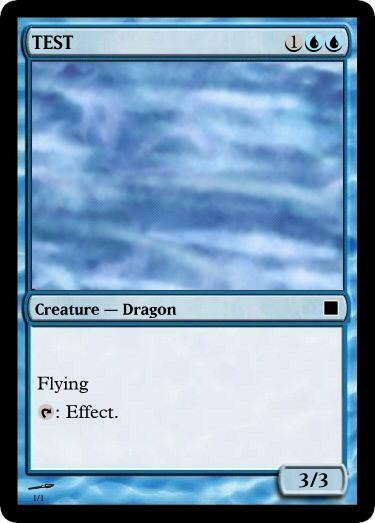 The base idea was a 3 drop (two of its color and 1 colorless) creature (we said dragon but that was up to debate) that was 3/3. Now we also wanted a unique trigger for their effects, or at least one that hasn't been used for a set of 5. Enter the battlefield was the titans so that was moot. When it dies was the kamigawa big dragons, so that wasn't preferable if these ended up as dragons. They'll be like... baby versions. We settled on a tap:effect mechanic. Hopefully, a cost-less tap. To sum that up, the base concept we came up with was. Just an example of what I was thinking of a frame. As I was drawing one of the dragons today (the blue one), he ended up more serpenty than I thought. But that's went I thought, hey.... they could be serpents! Or something else along those lines. Or anything. Bears. Memnites. What I'm asking is for you guys to pleaaaassseee pitch your ideas for this. Like creature types, cost, effects, P/T, the whole 9 yards. You don't need a neat picture or anything, just a slights contribution could help. But in the mean time however, I'll keep sketching. Thanks a head of time peoples. What do you mean by a mana abillity? Like a Llandowar Elf abillity or like pay like "(2)U:Effect"? I like the concept of tapping since it staves off spamming. Although if we put an mana payment alone we *could* drop the mana cost of the creature itself since you have to pay more to make it useful. When I was thinking a three drop, i was thinking the effects were not exactly game changing, although if we would like to push the cost up, the effects of course would power up. You have any ideas what the effects could be?